Visits: 30322 persons viewed this recipe. Kerala is one of the top producers of fish and coconut in India. Naturally fish and coconut plays a major role in malayalees food culture. 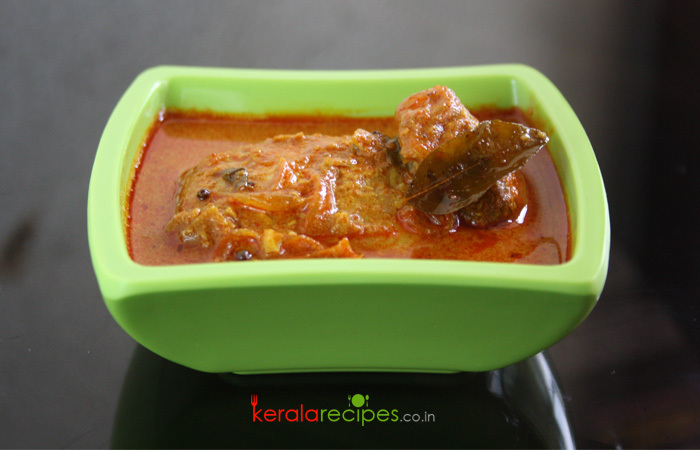 Here is the recipe of a Kerala fish curry with coconut. Hope you will like it. Dissolve tamarind in 3 cup of water. Remove the seeds and any pieces that have not dissolved with the water. Slice tomato (optional) and chop ginger. Grind grated coconut and shallots well into a fine paste by adding ½ cup of water. Cook fish pieces (about 10 – 15 minutes) in a covered vessel along with tamarind dissolved water, chilli powder, turmeric powder, tomato (optional), ginger, curry leaves and salt. (When it starts boiling, turn the flame to low). When it is done, add the ground paste and combine it. Taste for salt and wait till it boils. Remove from the flame and drizzle 1 table spoon coconut oil over the prepared fish curry. Let the curry remains in the cooking pan for minimum 30 minutes, allowing all the spices to steep into the fish. If you don’t have tamarind, use kukum star (kudam puli) as an alternative. But I recommend to use tamarind for this coconut based fish curry. pls include the recipe of prawns curry also..
i have tried ur recipes and its very good…. Hi Ann, It is pleasure to know that the recipes worked out well for you. I will definitely do a prawns recipe when the time permits. Thank you very much for the feedback. Hi Shaan, just curious my mom used to add coriander powder to fish curry, so we don’t need that ingredient. I haven’t tried, but will try today. Hi Shobana, Thanks for the comment. In traditional Kerala fish curries, we usually won’t use coriander powder. But while preparing Fish Masala kind of dishes we make use of it. Hope it comes out well for you. Hi Shaan, Let me know the type of fish you use. Hi Vasantha, I used Seer fish, but you can use any fish of your choice to prepare this curry. Thank you for the recipe.. I am a husband and on holidays so tried this at home and everyone loved it. Will try others in your site as well.. once gain thanks and you rock! Hi Shaan, Thank you for the recipe. It was very tasty and my husband enjoyed the it. Hi Vilasini, Thanks for finding time to share your feedback. Happy to know that you and your husband enjoyed it. Awesome!!!! recipe… tried this recipe…. came out superb. Hello this is the first i have gone through your site and found very helpful as your dishes are very simple and very tasty. Please I would like to have Kerala style dry chicken recipes. Prasanna, Thanks a lot for your words of encouragement. I will try to include more dry chicken recipes when time permits. Thanks for the feedback.